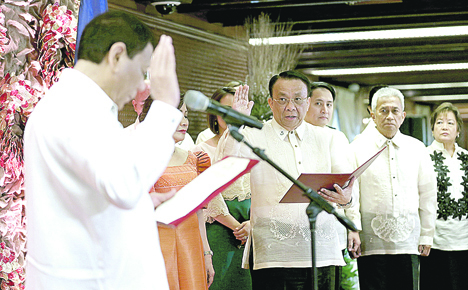 President Rodrigo Duterte administers the oath of office to newly appointed Supreme Court Chief Justice Lucas Bersamin of Bangued, Abra, the 25th to assume the post since Cayetano Arellano of Orion, Bataan in 1901 during a ceremony on Wednesday. Bersamin earned his undergraduate course at the University of the Philippines and his law course at the University of the East. He placed 9th in the 1973 bar exams.